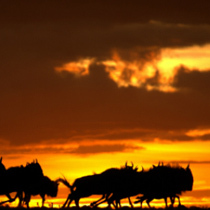 Mysterious, exciting and remote, Africa is the perfect choice for a romantic holiday of a lifetime. The wild beauty of its vast savannas, the thrill of close-up encounters with the Big Five, the old-world charm and romance of traditional safari camps deep in the wilderness, the castaway tropical beaches – all these add up to honeymoon heaven. Drift above the game-packed plains of the Serengeti in a hot-air balloon… A holiday in East Africa is exhilarating, intimate and romantic. It cocoons you in a world of spectacular beauty, wildlife adventure and tropical beach bliss. The remarkable hospitality and warmth of the people of East Africa ensure you a once-in-a-lifetime experience and rich memories to share forever. Asilia’s camps offer idyllic settings, elegant simplicity and serious comfort. Even better, our experienced staff anticipate your every need to ensure you the luxury of relaxing entirely. And you don’t have to be newly wed: an idyllic escape for two is just what is needed to celebrate any special anniversaries or just the joy of being together. The sheer romance of a safari or remote Zanzibar tropical island escape makes East Africa the perfect choice for a honeymoon or special holiday for two. Asilia will give you a truly authentic and personal experience, and you will feel as though you have the entire place to yourself. Our camp managers and staff pride themselves on going the extra mile with special touches and surprises that will add even more romance to your holiday, like private, lantern-lit bush dinners for two in gorgeous, secluded settings. We don’t want to give away too many of their secrets here, but know that you’ll be in the best and most thoughtful hands. For the best of all possible worlds, choose a romantic Bush & Beach package. For example, choose award-winning Sayari Camp in Tanzania for an unbeatable safari experience and then follow it up with some time at Matemwe Retreat, a tropical beach paradise on Zanzibar Island, to experience another facet of beautiful East Africa. Sayari is the pick of the Serengeti. It is renowned for extraordinary wildlife sightings and supreme comfort. 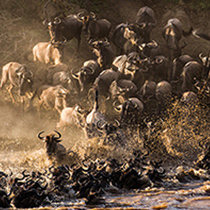 Set on the unspoilt plains of the Northern Serengeti, close to the famous Lamai Wedge, Sayari gives you easy access to the Mara River for astounding viewing of the Great Migration as well close-up encounters with incredible wildlife, from lion, cheetah and antelope roaming the plains to elephant and rhino. Once you’ve experienced the world’s finest game viewing, relax in your elegant honeymoon suite at camp or enjoy the dramatic views over the northern plains from the rim-flow swimming pool. Intimate, contemporary and elegant, it is no surprise that Sayari Camp is regularly voted one of the top safari escapes on the planet. When it is time to say goodbye to the bush, jet off to Matemwe for some tropical beach bliss on Zanzibar. Zanzibar is the perfect destination for post-safari relaxation and rest. Matemwe Retreat offers total privacy and personalised service in an exclusive-use villa complete with private plunge pool on the spacious roof terrace. After long, lazy beach days, enjoy romantic sundowners at home just metres from the clear tropical waters. In the evening, candle-lit dinners under the stars cooked by your private chef offer a new level of romance. With our smaller camp sizes and personal service, every one of Asilia’s camps and lodges offers you the chance to escape in romantic solitude. Just arrive and we’ll take care of everything else. Our secluded and deeply comfortable tented suites let you get away from it all – sink into a day bed or sofa on your own private veranda to while away the midday heat and let the animals of Africa come to you. Honeymoon tents at Namiri Plains and Sayari Camp in the Serengeti and Oliver’s Camp (Tarangire) go the extra mile and will not disappoint. A private game-viewing vehicle with your own dedicated guide will allow you to safari at your own pace. It is a little luxury that gives you maximum special time together to discover Africa’s hidden gems and secret spaces. Don’t miss the chance to take a hot-air balloon trip to float above it all, sailing in silence over the vast, game-rich plains and enjoying the most beautiful sunrise of your lives. Follow this with a Champagne breakfast in the heart of the bush for unbeatable romance and excitement. Africa’s famously spectacular sunsets set the scene for romance: enjoy private sundowners in a secluded bush location, followed by a candlelit dinner under the African night sky. Hollywood couldn’t do it better! The transparent turquoise waters edged with palm-fringed white sand beaches, glorious sunshine and vibrant culture of Zanzibar give you the tropical island holiday of your dreams. Located on the northeast coast of Zanzibar, opposite the famous Mnemba Atoll, Matemwe Retreat is sheer island-style bliss. Combining the spirit of Zanzibar with the highest standards of comfort, Matemwe Retreat is secluded and very, very special. It is just metres from the Indian Ocean – so close you can relax in a hammock on your private sun deck and feel as though you are on the beach. A dedicated butler will ensure that your every whim is catered for. Select your menu with the chef each morning, sip a fresh cocktail in your roof-top plunge pool and enjoy a relaxing massage in the privacy of your villa. Little touches – like the en-suite bathroom with generous sunken bath and huge walk-in shower, and comfortable day beds beside the pool on the sun deck with spectacular ocean views – make it hard to tear yourself away from your private slice of heaven. There is plenty to do if you can bring yourself to leave your sanctuary. Sail away on a traditional dhow to a completely deserted beach for a day of world-class snorkelling or diving. When the afternoon draws to an end, enjoy the spectacular sunset and sundowner cocktails as you sail back. Or head out to Mnemba Atoll to share the crystal-clear waters with brightly coloured reef fish, glimpse playful dolphins and serene turtles. Escape to Infinity Beach or Muyani for a delicious lunch on a delightfully secluded beach before heading home for a candle-lit dinner under the stars, prepared by your personal chef.